Daedra are creatures and sentient beings that can be found across the vast expanses of Oblivion. 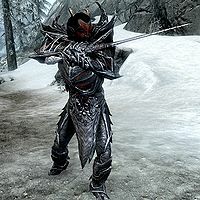 Only two of these types of Daedra appear in Skyrim, however: the atronachs and Dremora. Despite the lasting ramifications of the Oblivion Crisis, conjurers across Tamriel could not resist the allure and power associated with summoning Daedra and attempting to command them. Many of these summonings are successful and those Daedra serve their masters without fail, but even more summonings go wrong and result in unbound beings turning on their masters. All Daedra that appear in Skyrim are categorized here. For Daedra added by Dragonborn, see this page. Atronachs are intelligent elemental Daedra that can be called forth from Oblivion to serve a conjurer in battle against his or her foes. Atronachs are all immune to paralysis, cannot be reanimated, and cannot be made invisible by any means. Dremora are manlike beings that are treated as NPCs in-game rather than as creatures, and therefore have stats, resistances, and perks more suited to that, as detailed on their page. Flame atronachs appear as female humanoids engulfed in flame, wearing intricate, black, metal armor. Though they are the weakest type of atronach encountered in Skyrim, they are extremely agile and reasonably proficient in close combat. Flame atronachs prefer to use their flame-based magic at a distance and will actively try to avoid melee combat if at all possible. While typically found in the employ of enemy spellcasters, the player can also conjure them and use them in battle. As these atronachs levitate, they therefore possess the innate ability to walk on water. When slain, unbound flame atronachs will drop Fire Salts, an alchemical ingredient. ^1This variant of atronach is summoned when the actor has the Elemental Potency perk. ^2This variant of atronach is only used for The Mind of Madness quest. 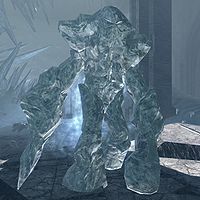 Frost atronachs are Daedric constructs of solid ice that resemble over-sized humanoids. They have a long melee reach and their attacks usually stagger targets, but they are entirely lacking in ranged options. Still, once caught in melee range of them, their chilling cloak slows targets and prevents easy escape. They can be summoned by you, and are occasionally used against you by enemy conjurers. 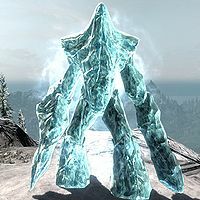 All frost atronachs have the innate capability of breathing underwater, which is relevant because they are also the only variant of atronach present in Skyrim that does not hover above the ground. Upon death, unbound frost atronachs will have Frost Salts on their remains that can be looted. ^1This variant of atronach is only used for The Mind of Madness quest. ^2This variant of atronach is summoned when you use Conjure Frost Atronach. ^3This variant of atronach is summoned when an NPC uses Conjure Frost Atronach and if encountered as an enemy in the world. ^4This variant of atronach is summoned when the actor has the Elemental Potency perk. ^5There is a bug in the quest setup for the encounter with Arch-Curate Vyrthur that prevents this version from spawning. 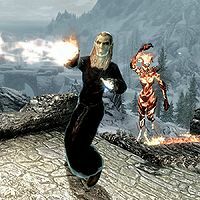 Storm atronachs are Daedra of elemental shock. They appear as a cluster of rocks quickly revolving around an unseen, electrified center of mass. Storm atronachs can be encountered as a hostile enemy, usually summoned by an enemy caster, or you can summon them to aid in combat. 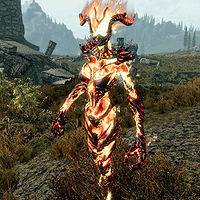 Like flame atronachs, the storm atronach hovers and thus has the Waterwalking ability. In their destroyed remains, you will find Void Salts that you can take. It is worth noting when considering storm atronachs for summons that storm thralls lose the ability to cast the powerful Chain Lightning spell when compared to the storm atronachs themselves. In this case, it may be wiser to simply recast Conjure Storm Atronach as needed for the more powerful summon. ^2This variant of atronach is summoned when you use Conjure Storm Atronach. ^3This variant of atronach is summoned when an NPC uses Conjure Storm Atronach and if encountered as an enemy in the world. †Due to an oversight, the Storm Thrall spell summons not these but instead just regular Storm Atronachs (potency is still obeyed). The only differences, however, are the name, the attributes, and the lack of improved regeneration. This bug is fixed by version 3.0.1 of the Unofficial Skyrim Legendary Edition Patch. Dremora, like atronachs, hail from the planes of Oblivion, but unlike atronachs they possess a malicious sentience and directly serve the Daedric princes in their pursuits. These ruthless beings are obsessed with destruction and have their own variants and ranks. They can wear Daedric armor, have powerful fire spells, wield blazing weapons, and be among the most difficult of foes to face down. Dremora can be summoned by you with the Conjure Dremora Lord spell, and are a component in many quests. All specific information related to Dremora, including their ranks, roles, and stats, is captured in greater detail on the Dremora page. Hitting the Books: Find the books needed to identify the artifact found in Saarthal. Pieces of the Past: Retrieve the scattered pieces of Mehrunes' Razor and reforge this deadly blade. The Mind of Madness: Gain access to and solve the mystery of the Pelagius Wing. Touching the SkyDG: Find and retrieve Auriel's Bow. A few world interactions involve Daedra. Lore:Daedra — A page documenting all that is known about the vast number of species encompassed by the term Daedra. Lore:Daedric Princes — A list of all of the Daedric princes, their styles, and any other information known about them. Lore:Dremora — A description of the Dremora, their castes, and their roles in different periods of time in Tamriel's history. Lore:Elemental Daedra — An article specifically describing atronachs and the types found in the different Elder Scrolls games. 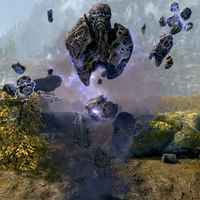 Lore:Planes of Oblivion — A list of all of the known planes of Oblivion that Daedra can inhabit. Skyrim:Atronach Forge — A page on the Atronach Forge, a location in the Midden that can create Daedra and items. Skyrim:Dremora — A detailed page on the specific variants of Dremora found in Skyrim. The following books contain direct discussion on the different types of Daedra that can be encountered. This page was last modified on 16 December 2018, at 20:15.